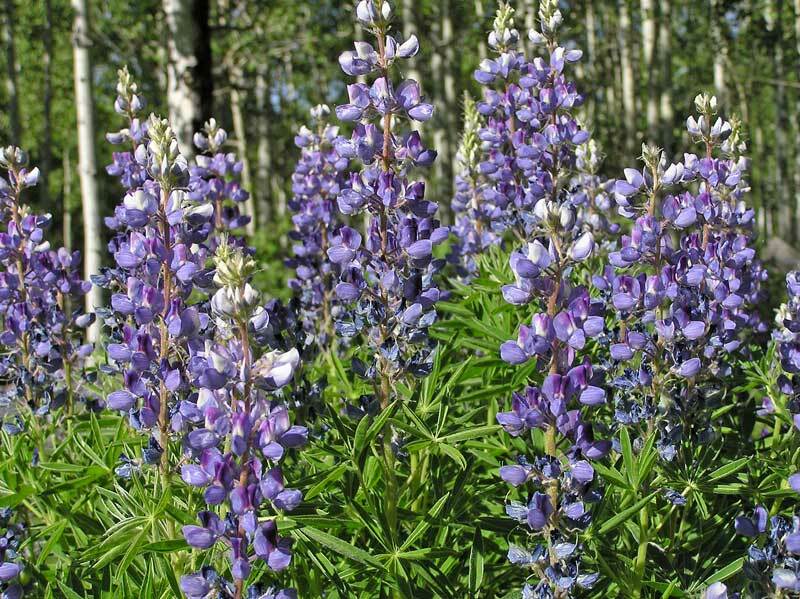 Click to read about Lupines in general. Foothills, montane, subalpine. Meadows, openings, woodlands. Summer. Above and left: West Mancos Trail, June 17, 2004. Lupinus prunophilus is very common and very attractive, often with a bushy 2 foot wide and high growth of leaves topped by very prominent and long-lasting flower clusters over a foot tall. 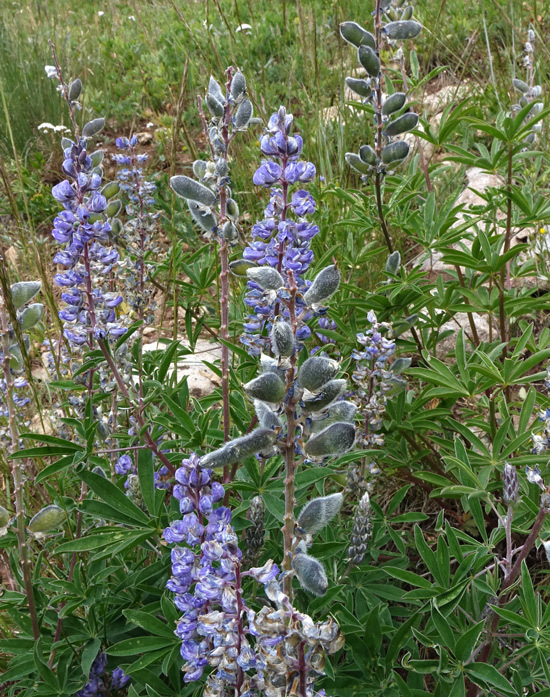 Lupinus prunophilus is shown in one of its common habitats: openings near and in Aspen woods (those are white Aspen trunks in the background of the photograph at the top of this page). West Mancos Trail, June 17, 2004. As flowers fade, seed pods mature. Lone Mesa State Park, May 14, 2009. 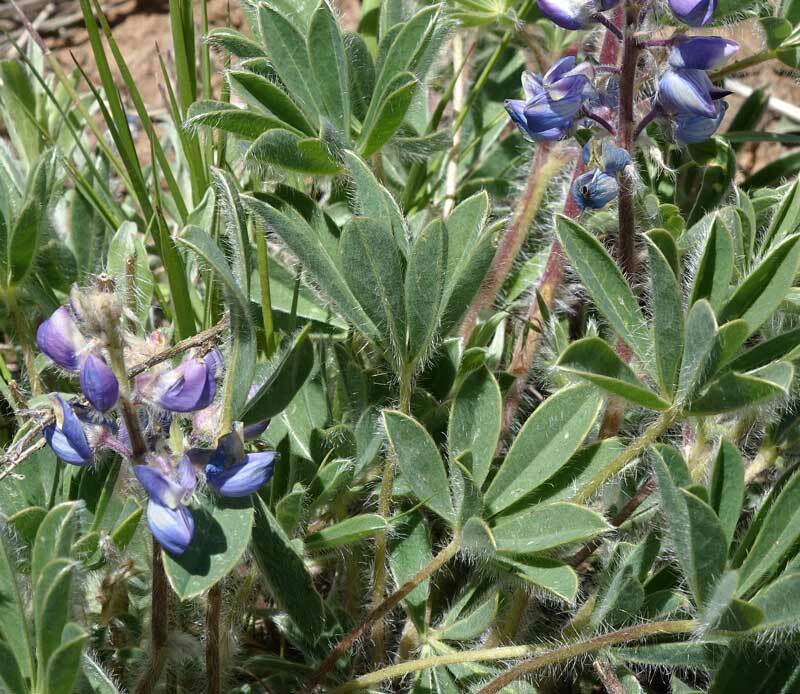 Such Lupine as the species pictured on this page are among the most robust, thickly flowering wild plants. They flower in wet and dry areas for extended periods. But they are often quite difficult to precisely identify. The pictured Lupinus prunophilus has a number of characteristics that vary enough to produce numerous varieties. 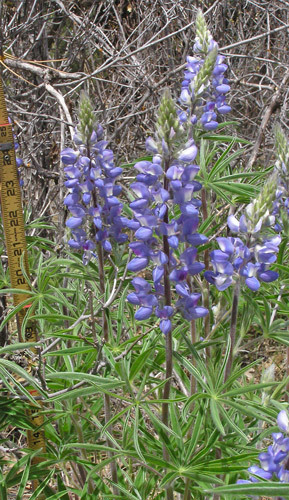 In addition, the characteristics that separate this species from several other perennial, upright, robust species of Lupine, such as, L. sericeus and L. bakeri are not markedly different. All of this makes for difficult times in identifying the exact species. Most of the floras available for the Four Corners region call this species Lupinus polyphyllus, but they do not agree on the characteristics of this species, nor do they agree on which characteristics separate this species from others. Some floras indicate that the pictured species is Lupinus polyphyllus variety prunophilus, some indicate variety ammophilus. John Kartesz indicates that L. polyphyllus is a west coast species. 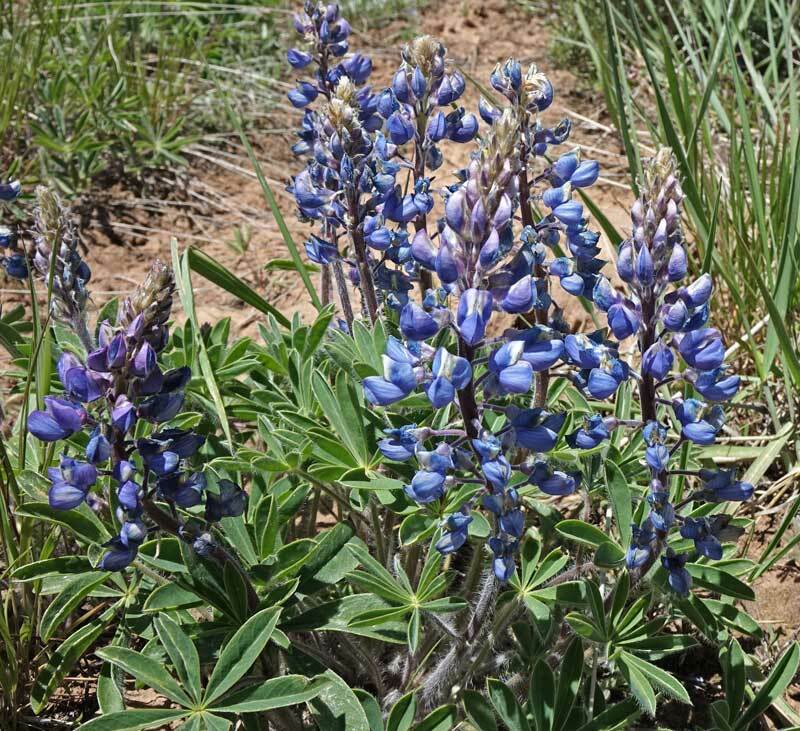 The Flora of the Four Corners Region indicates that our species is Lupinus polyphyllus with three varieties: Lupinus polyphyllus var. 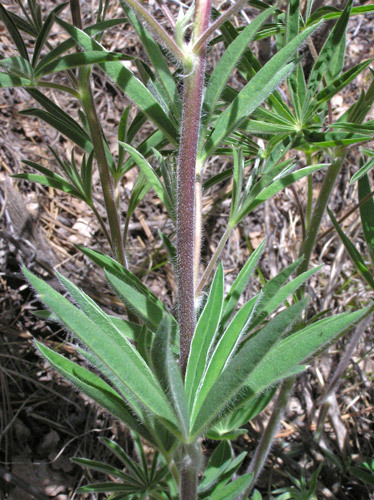 ammophilus; Lupinus polyphyllus var. humicola; Lupinus polyphyllus var. prunophilus. 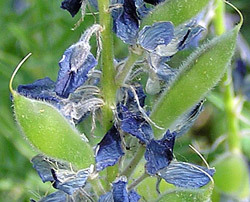 This web site stays with Kartesz identification of Lupinus prunophilus. 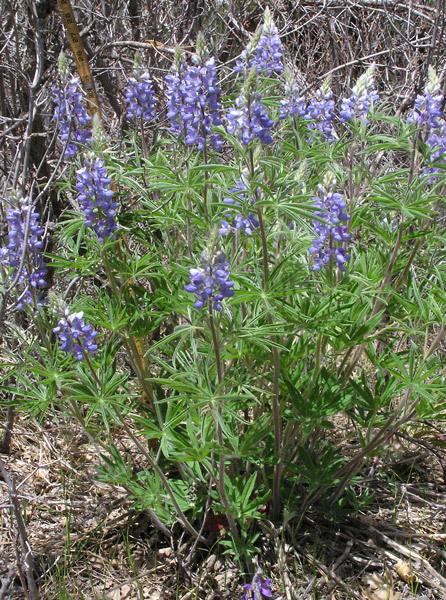 Lupinus prunophilus was named by M. E. Jones in 1910 from a collection he made in the same year in Utah. Lupinus polyphyllus was named by Lindley in 1827 from plants raised from seeds collected by David Douglas (of Douglas Fir fame). "Polyphyllus" means "many-leaved" and "prunophilus" means "Choke Cherry loving". Most leaves on this plant were rolled inward. Look at the flowers at the two and five o'clock positions and you will see a characteristic that botanical keys use to separate Lupine species: The banner (the upright petal with the white center) is bent upward ("recurved") near its mid-point, i.e., about half of the banner clasps the wings (the horizontal light purple petal) and about half of the banner sticks up in the air above the wings. This arrangement leaves a wide gap between the wings and the upward curved part of the banner. 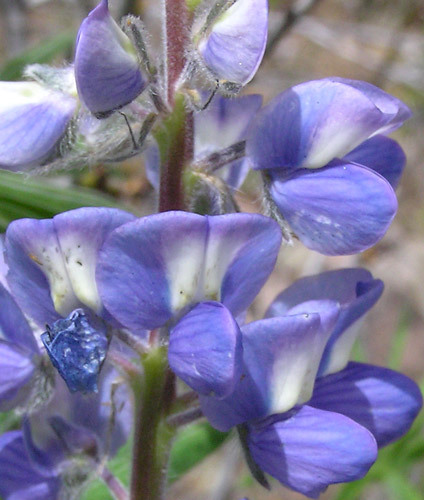 Click to see Lupinus argenteus which has its banners recurved above its mid-point, thus leaving a narrow gap between the wings and the upward curved part of the banner. Hairiness varies: A few leaves that I examined on this plant were hairy both on their upper and lower surfaces; but almost all were more typical of the leaves of this species: hairy only on their lower surface. The photograph also shows the hairiness of the stem. You can see the silvery glow of the hairs at the side of the stem. Nature Center at Butler Corner, May 21, 2017. 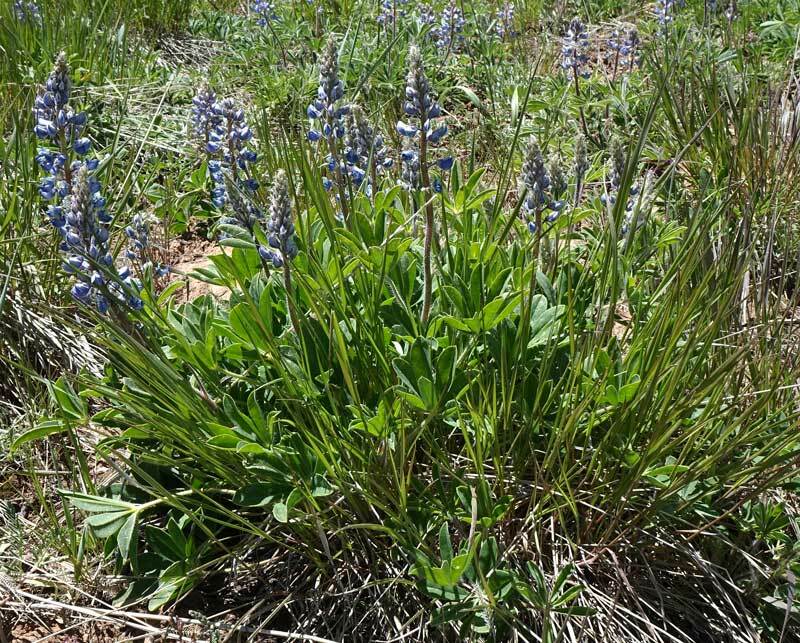 This short form (only one to two feet tall) of Lupinus prunophilus spreads by rhizomes and as a result dozens of plants are found close to each other. Flower stems are numerous and dozens of showy flowers ascend the stems. Stems rise above a base of many long-petioled, large leaves with 5-10 leaflets. The upper side of the leaflets is almost glabrous and the lower side has scattered long hairs.